One of the most beautiful theological symbols of our Faith is the image depicted on the discos at the conclusion of pre-liturgy. “Here we have the icon of the Church,” I remember learning. In the carefully arranged particles of bread all are represented, the center-Christ Himself, those present and past, forefathers, foremothers, those living today, old and new, well and infirmed. We are all part of Christ’s body, we share in his struggles so we may share in his victory. So is the blueprint laid out for us as we, children of the Church, walk together through this life, loving one another, helping one another. 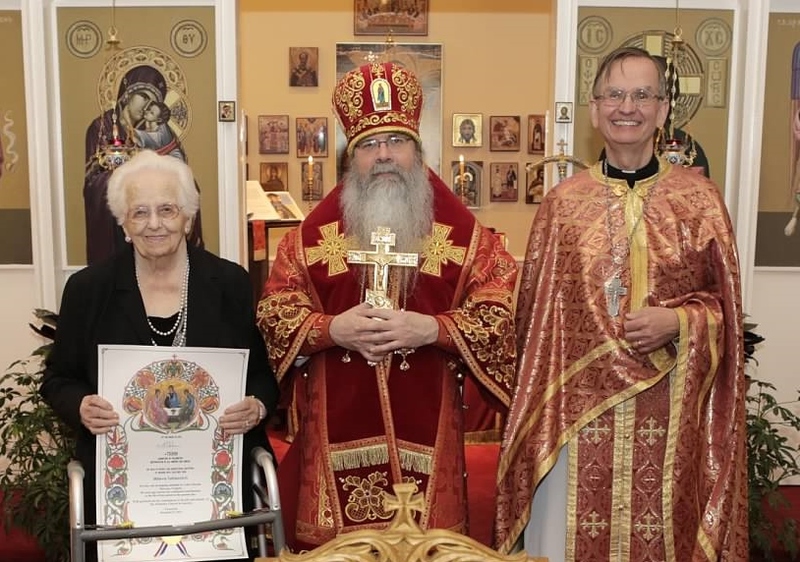 Mileva Tatalovich, an Alzheimer’s patient at Saint Luke Church, McLean, VA, was recently awarded a gramata by Metropolitan Tikhon as a church founder and faithful member of the parish’s choir and sisterhood. In 2010, Alexei Krindatch presented to SCOBA his statistical research of what our parishes look like. It is not surprising that in our churches the 65+ population is 21% when our nation’s is at 12.9% since maturity tends to lead many back to a life in the Church. What we must all take note of however, is that in our typical parish of 100 adults there are currently around 20 individuals that are at increased risk for the development of a memory disorder. This fact should lead us to desire to learn more about this malady so that as a Church family we can all be armed with the knowledge to assist one another without fear or ignorance. Having the advantage of today’s information age, it would not be prudent to spend extreme time and effort in this article defining Dementia and Alzheimer’s Disease. The end of this article will contain a Bibliography intended to start one on this important journey. The next few paragraphs are intended to stimulate your interest towards understanding. Dementia is not in itself a disease but is rather a syndrome or a group of symptoms caused by over 102 disease entities. At least 70 of these diseases are irreversible and progressive, ultimately leading to death. The most common cause of dementia is the disease known as Alzheimer’s. Discovered by the German Physician Alois Alzheimer, it is by far the most common of dementias accounting for 70% of all cases. It is notable and telling that when questioned, most individuals would guess that Alzheimer’s disease was first discovered sometime in the mid 80’s, perhaps 70’s. Dr. Alzheimer discovered this disease in 1906. Perhaps the most succinct method of describing the effects of Alzheimer’s Disease on an individual’s ability to function is graphically. The following computer representation shows on the left, a healthy brain, whereas the right depicts the brain with advanced Alzheimer’s disease. The brain affected with advanced Alzheimer’s has holes where healthy brain tissue once functioned. Due to the disease process, the brain cells have physically died. Individuals suffering from the challenges of this disease come from the ranks of everyday, “normally” functioning individuals with everyday hopes and dreams, all walks of life, all professions. Please note, this is not a psychiatric disorder. It is a physical, organic disease that leaves an individual desperately attempting to lead a normal life based upon what their brain is telling them; their brain that now has holes where healthy tissue once functioned. Alzheimer’s Disease will take a predictable path through our brains. This predictable path enables us to learn about what normal functioning should be for the section of the brain affected and in turn predict an individual’s challenges and positively intervene and support them. For example, the disease starts its journey in an area of the Temporal Lobe called the Hippocampus. This functions normally to store recent memories, converting short term memory to long term memory. Information is received and placed into storage for later retrieval. Any of us at times, due to stress or over stimulation, experience this challenge. However, when the cause of this symptom is due to the destruction of brain cells, the symptom is permanent and life changing. The path of Alzheimer’s disease generally takes about 10 years to complete its course, but not everyone experiencing changes to their Hippocampus, experiences all the stages of the disease. In some cases this loss of short term memory, or Mild Cognitive Impairment, may be the only symptom an individual experiences. Along with short term memory, the Hippocampus also gives us our awareness of the passage of time. Therefore, references to time frames in relation to upcoming appointments, etc. will confuse this individual. Based on this information, we may all begin to draw conclusions regarding certain members beginning to experience these symptoms. The purpose of this article is not to identify, and then mark certain of our elders, but rather to help us, through awareness, develop a framework of conduct that can in fact benefit all seniors, thereby making sure the needs of all are met. For example, it is likely that an individual experiencing the challenges of Mild Cognitive Impairment is still driving themselves to church. The path to church is well imbedded in all of our long term memories. Offering a ride to an elder who may live along our route to church is a way not only of insuring safety for an individual challenged with memory loss, but also a way to ensure that an elder with failing eyesight, or slow to respond arthritic joints arrives to services safely. From the Hippocampus, the disease progresses to the Frontal Lobe. This part of our brain gives us reasoning and problem solving. It controls our impulses, emotions, and safety awareness. When considering impairment of the Frontal Lobe, it is understandable that many may be too worried to attempt to bring an elderly parent or loved one to church with this type of impairment. Please consider, this section of our brain is the last to mature in our growth and development; some experts saying not until 25 years of age. Most of us have no issue bringing our children, or even adolescent children to services. Bringing an elder faced with Frontal Lobe impairment simply means understanding their challenges; observing them and assisting them as we would a young person at the other side of the continuum. At this stage we accept the responsibility to keep them safe. With Frontal Lobe impairment also comes the loss of ability to sequence. They don’t know what to do next. Therefore, a socially adept elder with this challenge will watch all others closely and take their cues from those around them. We need to make sure they get the information they need, approaching them from the front, carefully and confidently prompting. Fear and anxiety are emotions that can be easily read and mirrored at this point so relaxing and staying with the normal course of events is essential. A successful outing to attend Divine Liturgy can be a valuable, positively reinforcing success for an elder provided the elder does not perceive the activity too complicated. From the Frontal Lobe, Alzheimer’s Disease then takes its course through the areas of the brain that control our speech, visual orientation, and finally the processing of our sensory input: what we smell, see, taste, hear and feel. Individuals’ abilities to cope with these challenges will of course vary depending on many factors to consider such as support systems, lifestyle habits, etc, so the ability for this person to continue as a present participant in the life of the Church will vary. If it hasn’t already occurred, it is at this time that loved ones, health care proxies, and interested friends will need to consider what arrangements must be made to suit the individual’s needs, safety, and happiness. The options available and combinations of options are as varied as the individuals needing to be served. All locales have assistance and advice available for any level of economic need, but often the challenge becomes finding this assistance. If the elder happens to be hospitalized or go to rehab for treatment of a chronic disease at this juncture, this is the time to utilize the facilities’ Social Workers to seek out the best options and choices for the individual. They must ensure a safe discharge for your loved one, so advocate to make sure all options are made known to you. If the individual is residing in the community and needing assistance, contact your area Office for the Aging, a federally mandated, state funded organization that exists in every county throughout the country. Based upon your financial means, they can direct you to proper case management and/or care solutions for your loved one. It is often thought that the only care option for those with advanced Alzheimer’s or Dementia is within a Dementia Care Community or Skilled Nursing Facility. Although this may be the best option for some, it is not the only choice. Seek out advice specific to your needs, your elder’s needs, and take into consideration the strain and stress of everyday life for you and your family. There are any number of options and combination of options with the goal of keeping the elder safe in an environment that is acceptable to them while providing the care and support needed. Skilled Nursing Facilities - often needed once physical functioning has also declined. As always, continued love and support is present from our Parish communities for those among us who have moved along to a different stage in their lives. Visiting them, in any setting, is certainly appropriate. Here are some considerations to prepare for the visit. Depending on the individual’s lifetime habits and/or their current schedule, the time of day of your visit may impact the quality of the visit, so do research if possible. Don’t expect the individual to recognize you or know you by name. Honestly, it probably won’t matter to the elder. A cheerful, warm and loving visit by someone familiar will bring about positive emotions for the elder that can linger on for many hours or days. Utilize props, rely on reminiscence. We are blessed with the traditions of the ages. Don’t hesitate to bring service books for prayer, sing, or listen to church services. Gather parish archives, either from your picture files or from publications like anniversary commemorative books. Let the elder view the pictures and reminiscence. For holidays, bring along individual servings of tasty treats that will bring about warm memories. Have fun and use your imagination. You will be assisting them to use theirs. This article was written in large part using professional expertise of nearly 40 years of nursing practice within the elder population. Here are some helpful internet links that can get you started learning more. Utilizing today’s search engines will be able to further enhance your knowledge according to your interests and needs. How many of us know of someone – family, friend, or acquaintance – who has significant memory loss? How are they being cared for? Based on this article and other thoughts, what are ways that our parishioners can be helpful to those suffering memory loss and/or to their families? Why do their caregivers usually avoid asking for help from others? By asking for help or accepting help offered, how are the caregivers providing an opportunity for Christian ministry? Natalie Stavrevsky is the wife of Father Ken James Stavrevsky and a member of Saint John the Baptist Orthodox Church in Rochester, New York. She serves as Eldercare Consultant to the OCA Department of Christian Service & Humanitarian Aid. Natalie can be reached at nstavrevsky@gmail.com.